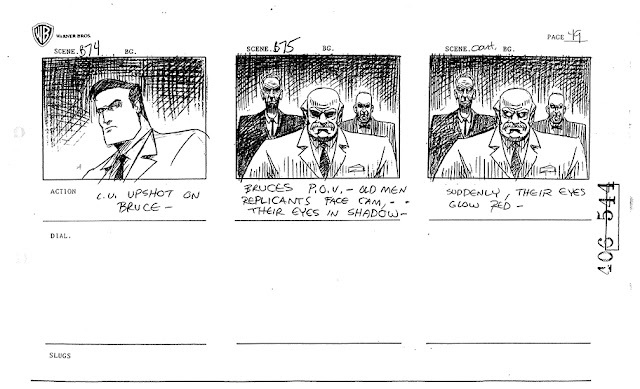 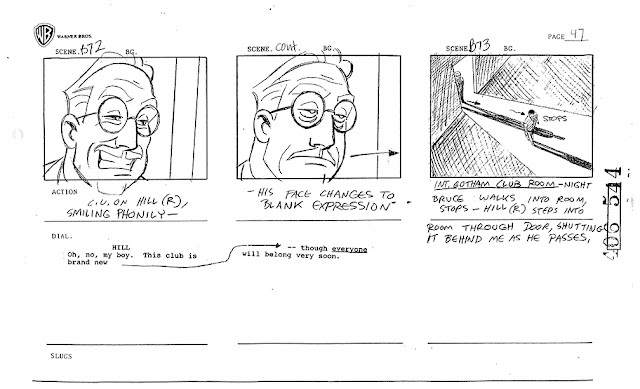 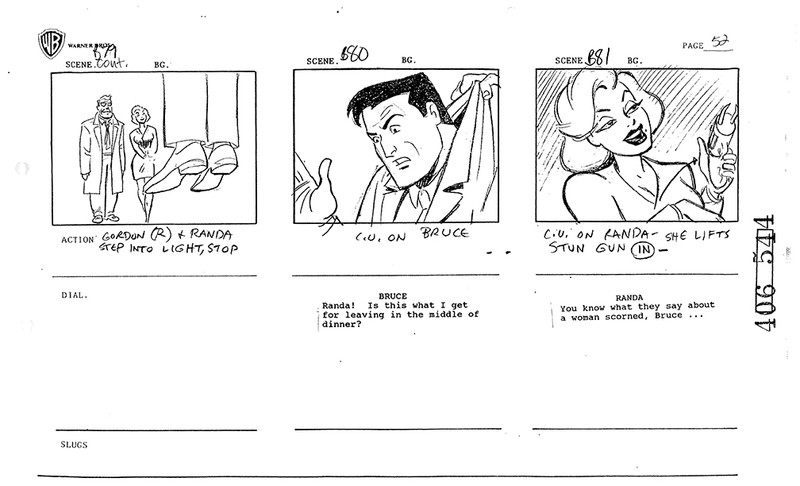 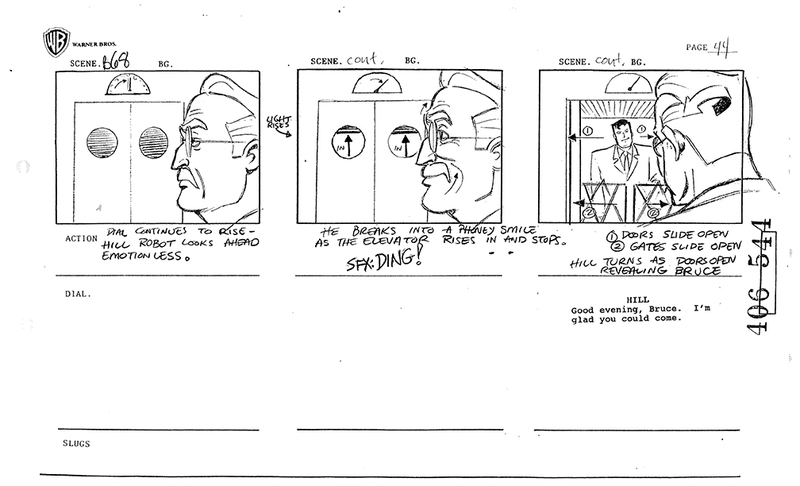 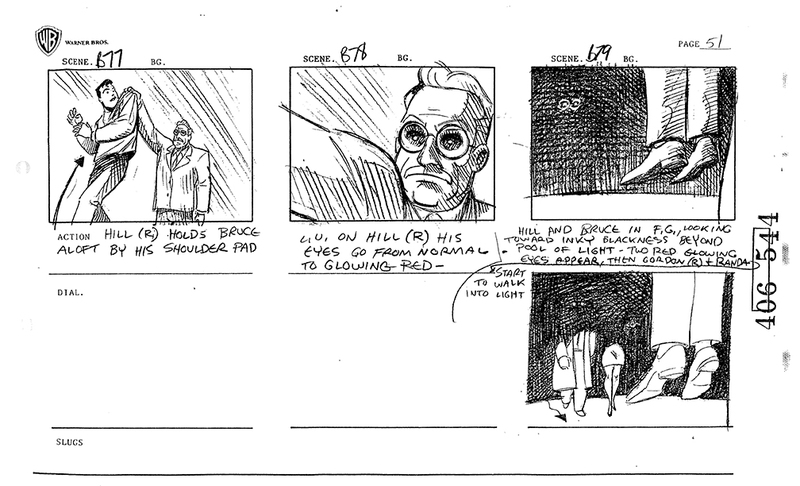 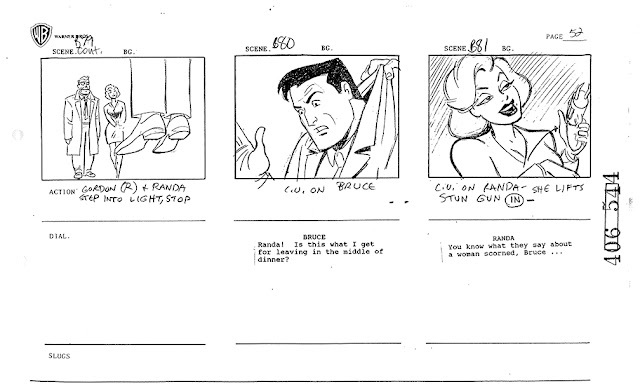 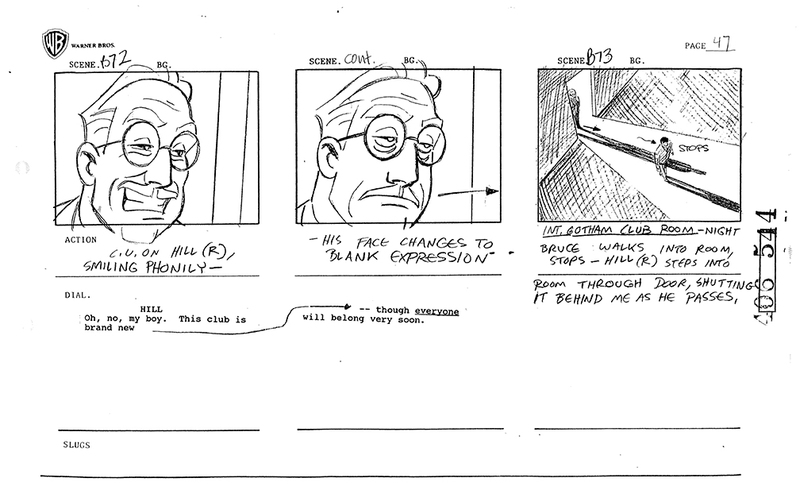 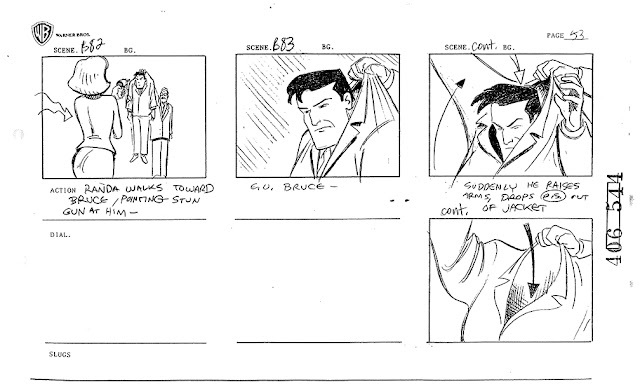 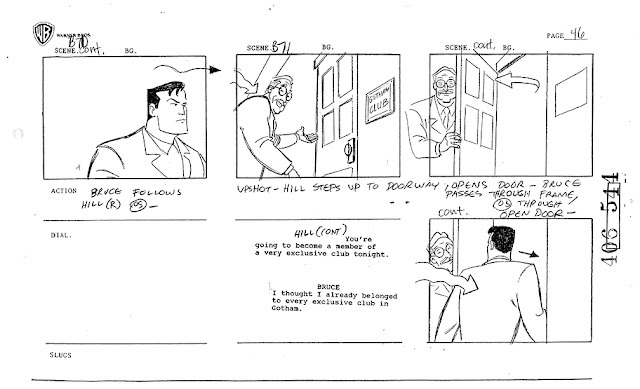 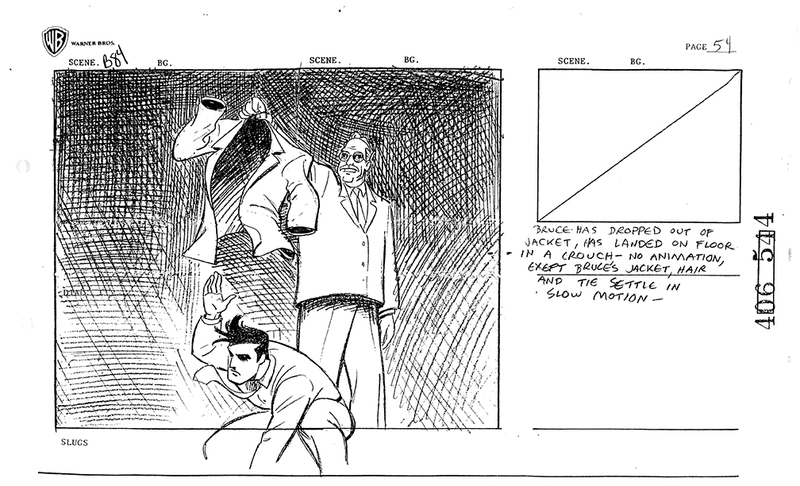 Herein I present pages 21 through 42 to Act Two of the storyboard to the Batman Animated series episode #44, entitled “Heart of Steel Part Two”. 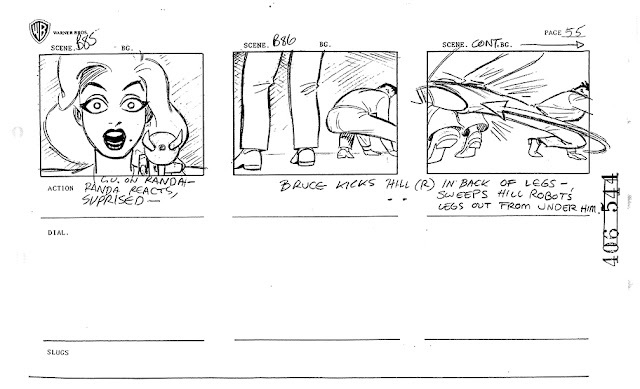 This episode was directed by Kevin Altieri. 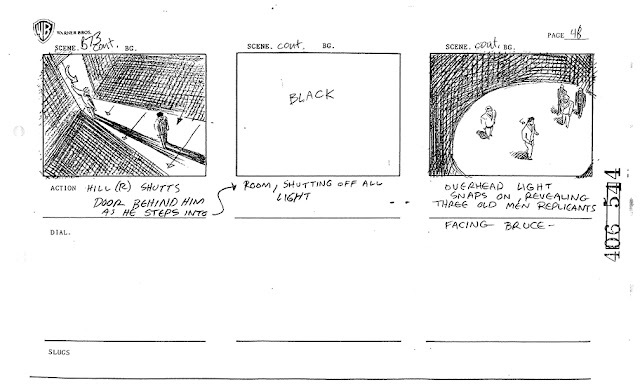 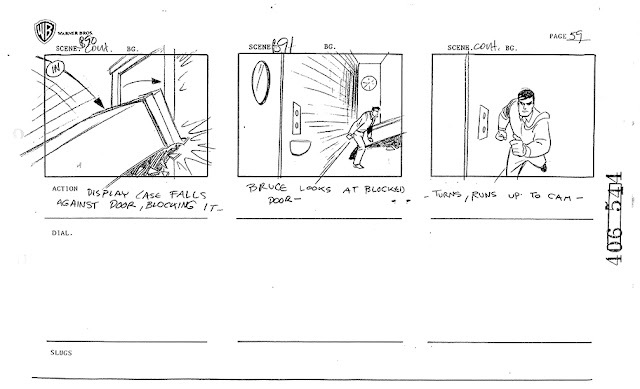 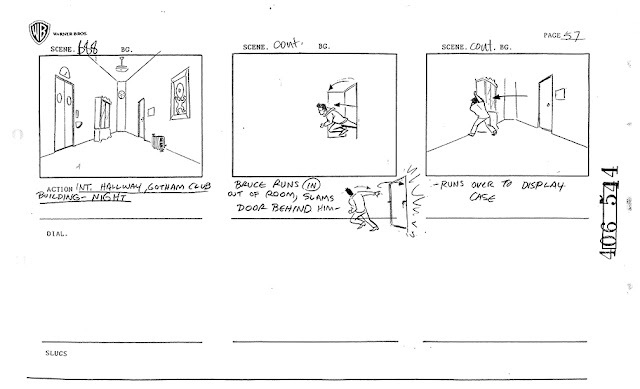 I am posting the storyboard in serialized fashion. 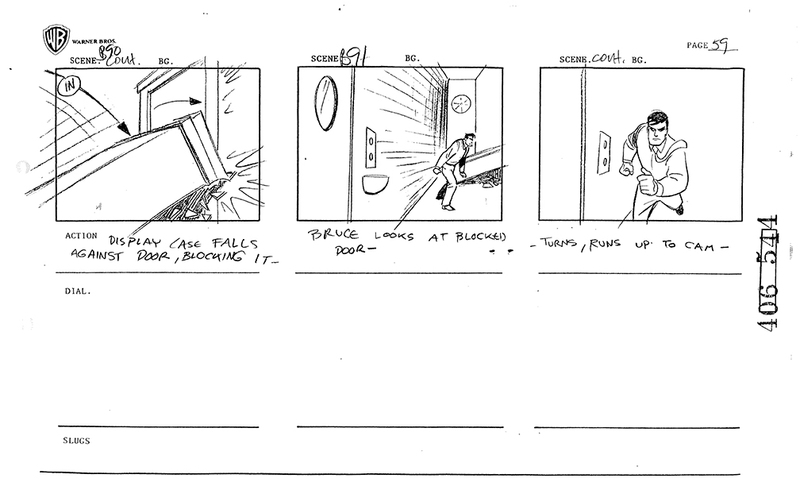 Kevin Altieri boarded this section. 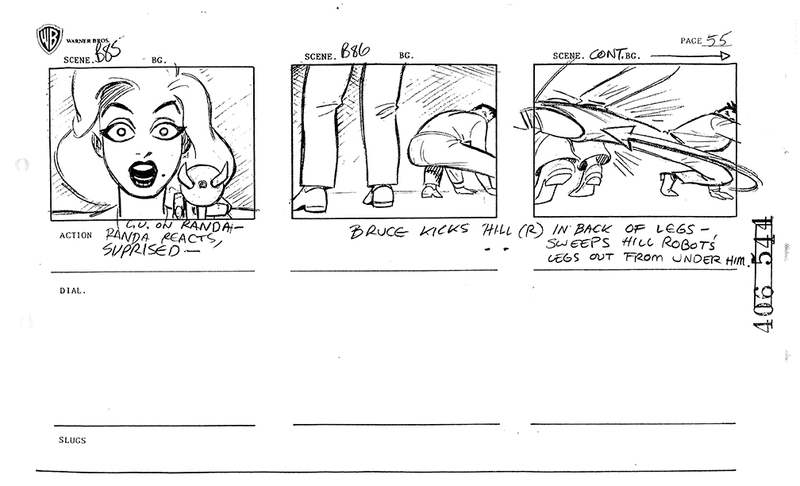 To be precise, I’d guess Kevin roughed this segment and Mike Gougen tight-pencilled it. Except for page 49, which looks like pure Altieri. 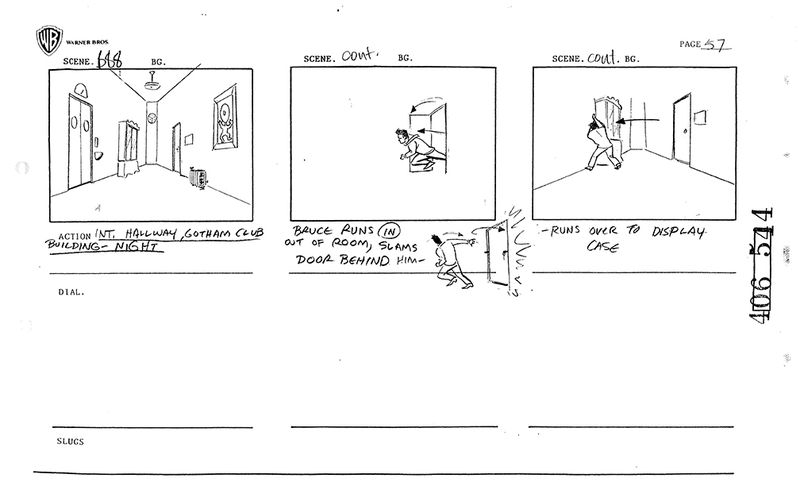 Scene B67 is fun; Kevin was working ahead of the BG Design crew, and amused himself in ways that probably didn’t make it into the episode-as-aired. 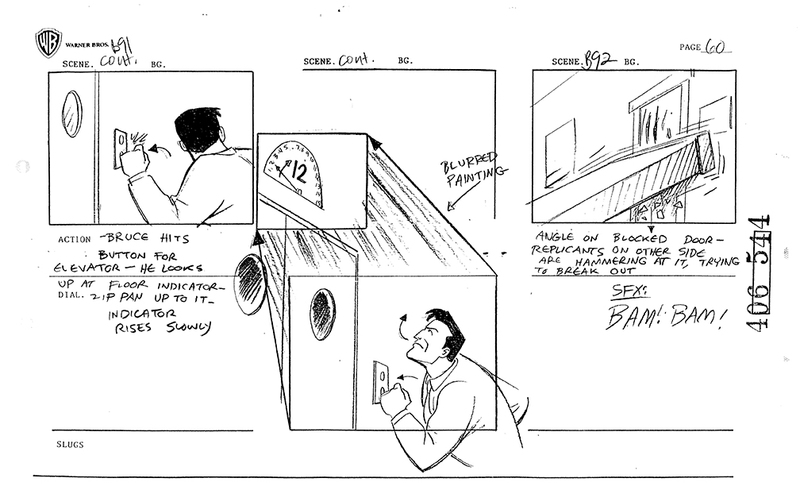 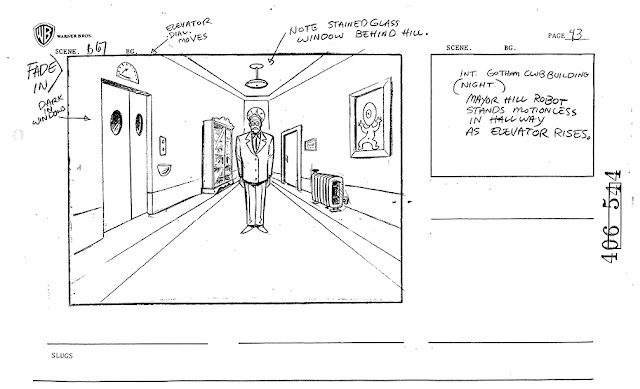 But I’m sure the finished animation retained the Kubrick (The Shining) flavor of this composition. 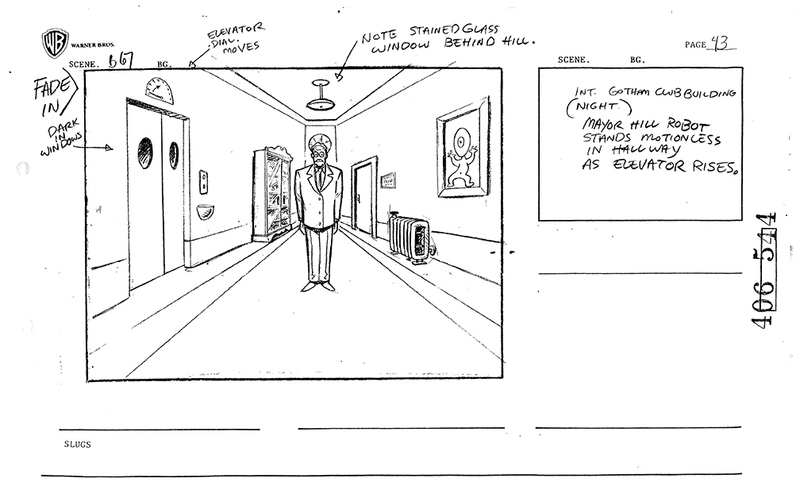 Hell, the whole thing is fun; Kevin was/is a ani-master and the sequence, as is all of his sequences, is full of laugh-out-loud moments of shock and amusement. B75) F’instance, glowing red eyes are always good for a laugh. 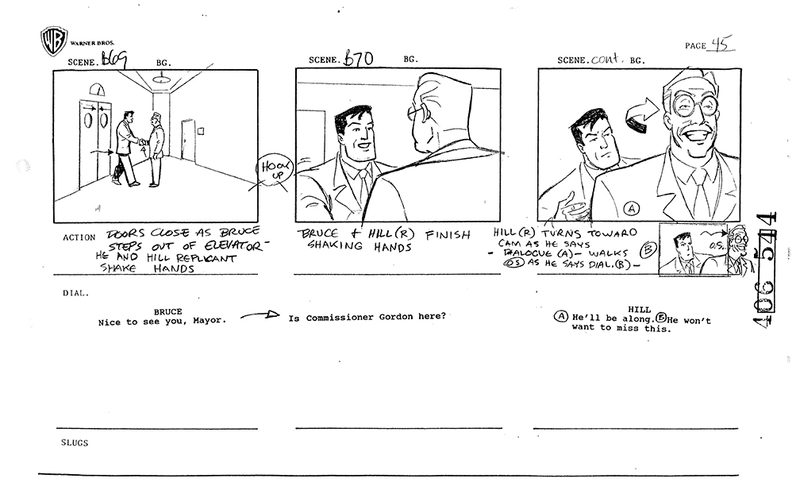 B76) Though Bruce laughs not, it gives me pleasure to see the rapid play of emotions across his face as he reacts, settles into combat-ready pose and then reacts again as he is grabbed from behind and yanked out of frame. 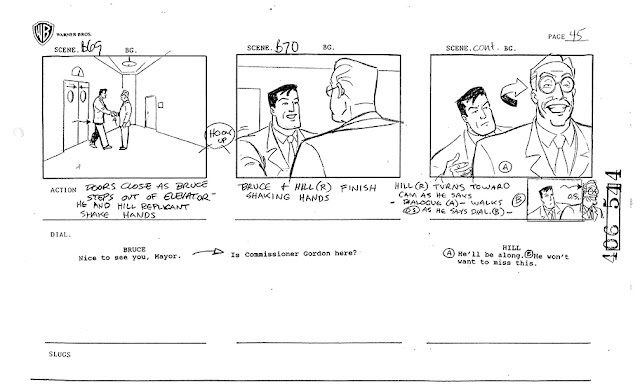 B77) Great idea: Robo-Hill holds Bruce aloft by the shoulder pad of his suit. Unfortunately, the drawing is unconvincing. 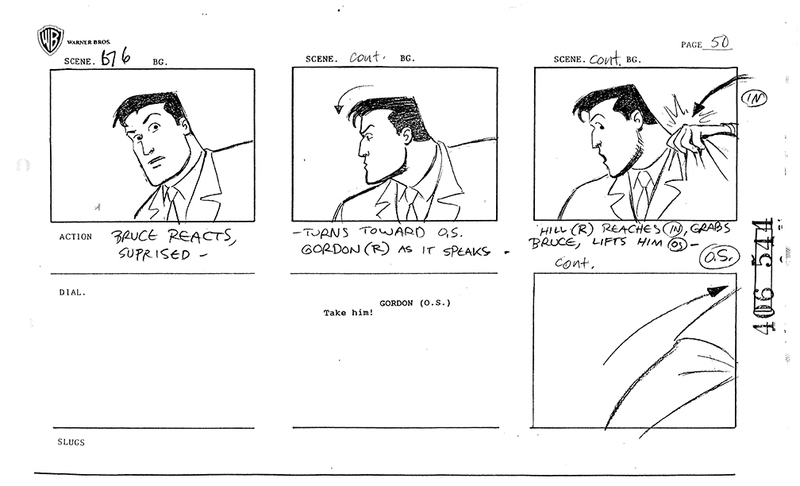 I would have made him (or Mike) give it another pass. 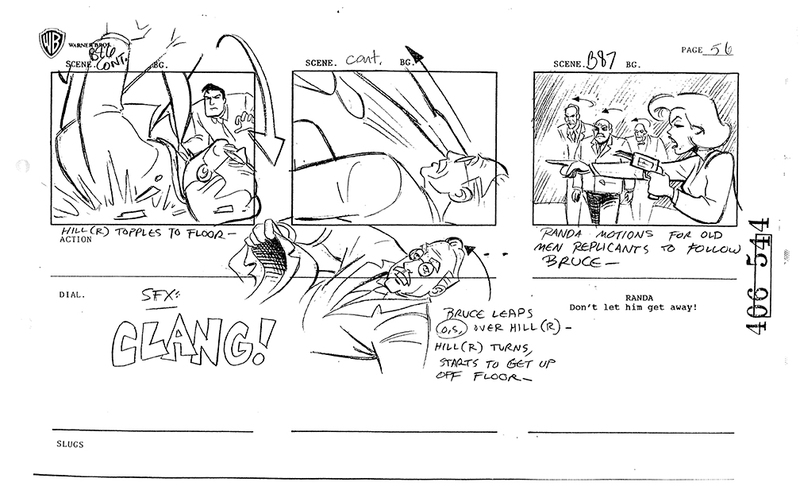 B83/84) The set up is redeemed as Bruce nimbly escapes his restraint by simply raising his arms and slipping free. B84) is a classic anime moment, no movement except for the settling of the fabric of Bruce’s suit jacket and tie.